We asked it before. What would give you an advantage if you were a plant? You have a vascular system to transport nutrients. You have seeds for reproduction that allow your babies to spread out in new areas. What next? Flowers! Flowers are the most recent evolutionary advantage for plants. When we talked about gymnosperms, we spoke of seeds. That was a big advantage. The angiosperms took it one step further. They not only have seeds, but they also have flowers. What kind of an advantage is that? 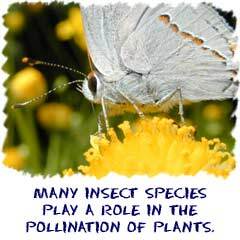 Many angiosperm species use wind for pollination the way that gymnosperms do. What if you didn't need to rely on the wind to spread your pollen around anymore? What if another creature could do it for you? Maybe an insect? Sounds like a new advantage. Those specialized flowers are able to attract organisms to help pollinate and distribute seeds. Another cool advantage is the fruit/seed packaging. Would you rather eat a pine cone or an apple? A lot of animals would go for the apple. When they do, they are able to spread the seeds across wide areas after the animal poops out the seeds. There are two kinds of seeds in the angiosperms, monocots and dicots. Monocot is short for monocotyledon. A cotyledon is the seed leaf. When you are a monocot, your seed only has one package of food. "Mono" means one or a single cotyledon. 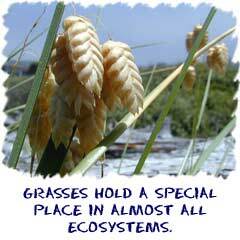 Monocots are made up of simple flowering plants like grasses, corn, palm trees, and lilies. Two of the characteristics of monocots are that their flowers have petals in numbers of three and their leaves are made of long strands. Think of the leaves of grass or a palm frond. 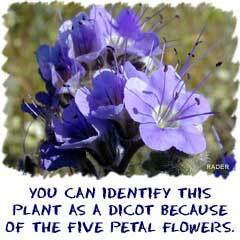 The other kind of plant in the flowering plant world is called a dicot. Dicot is short for dicotyledon. "Di" means two or a double cotyledon. These plants have seeds that have two cotyledons, two seed leaves of food for the embryo. Most of the flowers you see every day are dicots. They have flowers with petals in numbers of four and five. They also have really complex leaves with veins all over, not long like monocots. Some examples of dicots are roses, sunflowers, cacti, apple, and cherry plants.